#mylzh - General IRC chat. #trivia - Trivia bot running 24/7 with video game & speed run questions! 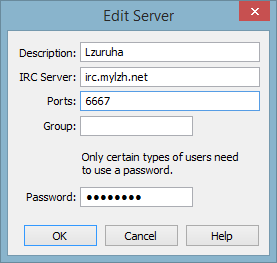 #wiki - Wiki IRC support channel, have questions or want to help? ring a bell here. Registers your nickname in the NickServ database. Once your nick is registered, you can use the SET and ACCESS commands to configure your nick's settings as you like them. Make sure you remember the password you use when registering - you'll need it to make changes to your nick later.